Posted: Thu Dec 04, 2014 11:26 am Post subject: Finally !!!! Posted: Thu Dec 04, 2014 12:51 pm Post subject: Re: Finally !!!! Posted: Thu Dec 04, 2014 2:27 pm Post subject: Re: Finally !!!! Posted: Thu Dec 04, 2014 2:33 pm Post subject: Re: Finally !!!! Posted: Thu Dec 04, 2014 4:04 pm Post subject: Re: Finally !!!! Congrats Joe, our season begins next week and runs till the middle of January 2015. Posted: Thu Dec 04, 2014 5:10 pm Post subject: Re: Finally !!!! Posted: Thu Dec 04, 2014 7:54 pm Post subject: Re: Finally !!!! Well done Joe...persistence does pay off in the long run mate. That is one nice looking buck, some damn fine ears there mate, a good BBQ or two for sure. BBQ, BBQ...party at Joe's house everybody...I'll stack the beer fridge. Posted: Thu Dec 04, 2014 8:35 pm Post subject: Re: Finally !!!! Congrats, SSJ! that's a nice size buck. I remember you being the deer count leader the last couple of seasons. Good to see you dry spell end. Posted: Thu Dec 04, 2014 11:32 pm Post subject: Re: Finally !!!! good stuff...whats the plan for lease now???? let it go or keep with it??? Posted: Thu Dec 04, 2014 11:42 pm Post subject: Re: Finally !!!! Nice animal SSJ. I miss whitetail hunting. Posted: Fri Dec 05, 2014 1:12 am Post subject: Re: Finally !!!! Nice looking deer! I might get some hunting in during the next few weeks. Posted: Fri Dec 05, 2014 3:08 am Post subject: Re: Finally !!!! Posted: Fri Dec 05, 2014 5:43 am Post subject: Re: Finally !!!! I wont renew the lease there next year I don't think any of the guy's I'm in with want to. We will look for another one . If the next one has the antler restrictions and is as far a way as this one I may not . I'll have to see. 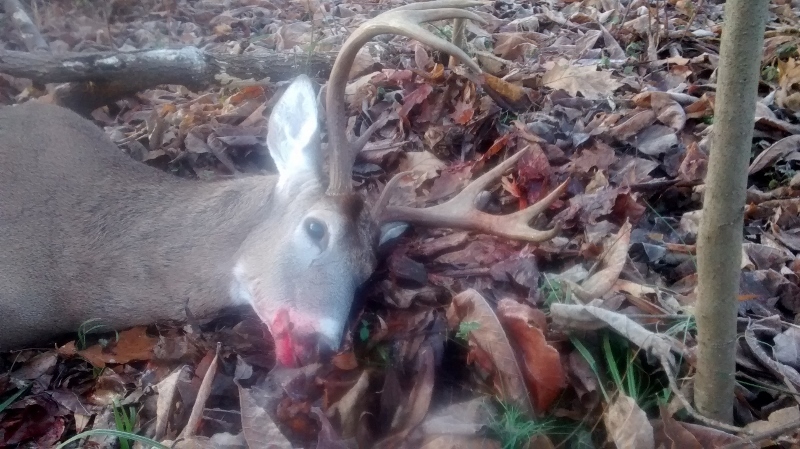 I didn't think the antler restriction would be a big deal but it turned out to be. I figured I could load up on a few doe's for meat and then maybe get a big buck . Seldom do things work out like we think when it comes to hunting . But with the cost of the lease + fuel cost +time in travel+ not seeing doe's + passing up meat bucks this one just turned out to be a bummer. We still have a week of rifle and then 2 weeks of late muzzle loader so I may try there again ( its paid for ) my vac is up so I only have limited time now..
Posted: Fri Dec 05, 2014 9:16 am Post subject: Re: Finally !!!! Posted: Fri Dec 05, 2014 12:17 pm Post subject: Re: Finally !!!! 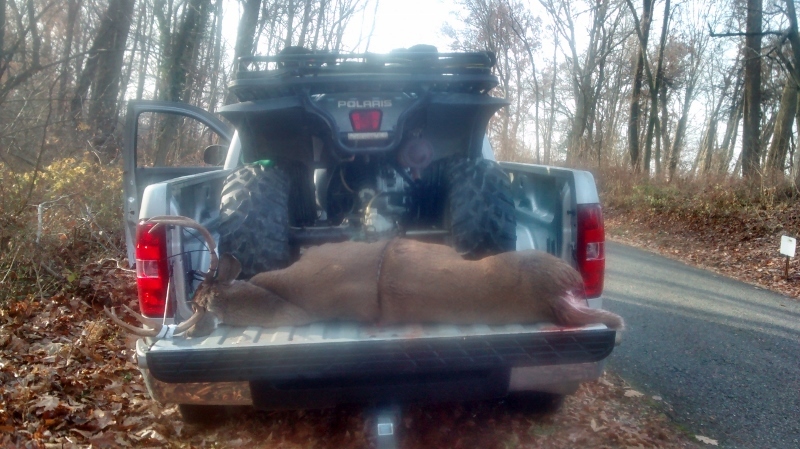 Nice buck and meat in the freezer. Good job!